The brochure gives a brief but vivid sketch of the game’s imagined environment—no pictures, just words—and explains the basic mechanics of play: a trial subscription buys you four moves through the first dungeons, and five dollars a month plus four first-class postage stamps keep a subscription current. I boil down handwritten, sometimes lengthy paragraphs that players send me to simple choices—does this mean go through the door, or continue down the road?—and then I select the corresponding three-page scenario from a file, scribble a few personalized lines at the bottom, and stuff it into an envelope. They respond with more paragraphs, sometimes pages, describing how they move in reaction to how they’ve landed. Eventually they recognize the turns they’ve taken as segments of a path that can belong only to them. The game is an alternate, post-apocalyptic reality (“DEADLY FUTURE/IRRADIATED WORLD”) that is fully and intricately imagined. A player’s goal is to make it to Trace Italian, a star fort, where he will be safe and protected. Until a player reaches his final destination, however, he must endure dangers and obstacles, fighting to survive along the way. He will come across dead bodies, deadly snakes, evil enemies, and extreme conditions. He must avoid these dangers and uncover clues and useful tools to move forward in the game. At the northern gate of Camp Oklahoma the capos have gathered around a pit fire. It is late at night and the stars above you shine, huge oceans of milky light. Too dehydrated to stand up, you hunker forward on your knees and elbows, prepared to fight with your fists and your teeth if it comes to that. An outcropping of sage provides partial cover, but if you stand up you will be seen. Around the fire stand the guards, consulting either a map or some blueprints, it’s hard to tell. In Camp Oklahoma, you are adrift, and each turn you take could be the one that leads you back to the same crag wall you landed against when you jumped off the train. No matter how many possible plans of the compound you sketch out in the dirt beneath you, none of them seem accurate and your days and their stops have begun to blur in your mind. Beyond the soldiers stands the gate, locked but maybe scalable, possibly electrified. The unlabeled bottle of pills that remains from your pharmacy run three days ago presses into your thigh through your pocket as the thirst turns your throat dry. Maybe you can make some kind of deal. Or maybe you’ll run straight for the fence. At the end of each turn, the player is given four options and must choose his next step. Thus, Trace Italian is essentially a Choose-Your-Own-Adventure for grown-ups. A wise choice will bring the player one step closer to Trace Italian, but an unwise choice will send him in the wrong direction. Because of his accident and subsequent isolation, Sean is no stranger to the power of escapism. He weaves the Trace Italian web so intricately that players begin to lose themselves in it. The line between what is real and what is imagined begins to blur. Some players, the lucky ones, feel their grasp of reality slipping and beg Sean to release them from the game before it’s too late (“But it’s in my head now and I don’t want it anymore so I’m going free-play here, you have to let me do this.”). But others, like Lance and Carrie, get lost in the world of Trace Italian before they can escape. When Carrie dies, her parents try to hold Sean accountable for her death. This description of the book is a more detailed version of the publisher’s blurb (which you can read on Goodreads here). When I read the blurb, I pictured something akin to a dismal Ready Player One: a nerdy escapist protagonist and an imagined game world. Based on the description, I thought that the book would largely be about Trace Italian, its effects on its players, and its damaged creator. What I got instead was a book more akin to To Rise Again at a Decent Hour: the first-person ramblings of a mentally unstable protagonist. Like To Rise, this is a character-driven novel to the extreme. Plot is extremely peripheral. For all intents and purposes, my description of the book (and the publisher’s blurb, as well) is accurate . . . but it’s also grossly misleading. The focus of this book is not on Trace Italian or its players. It is almost entirely about Sean’s isolation, his thoughts, and, ultimately (but entirely anti-climactically) his accident. The book is well written in a meandering, non-chronological way, but it is not the exciting, fast-paced, plot-driven novel you would expect from its description. I would have been much happier with this book if it had been more like its blurb. Who should read it: If you enjoy somewhat dark, character-driven books like To Rise Again at a Decent Hour, then this is a great choice for you. If you’re drawn to this one for the nerdy gamer aspect of it (as I was), read Ready Player One instead. 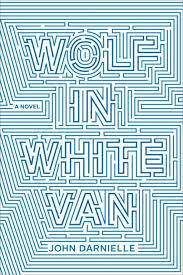 This entry was posted in Rating: 2.5/5 and tagged Book review, Book Reviews, Books, Gaming, John Darnielle, The Mountain Goats, Wolf in White Van. Bookmark the permalink.